Monday January 14, 2019 Guerneville CA. 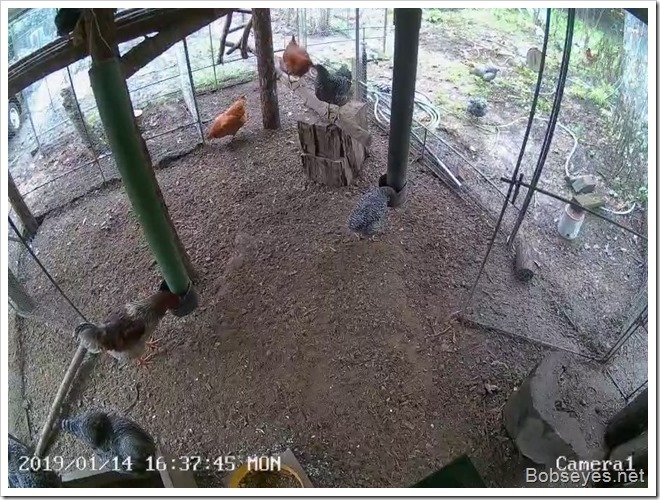 I checked out the new PTZ wireless cam last night and it worked real well so I needed to get it mounted today. 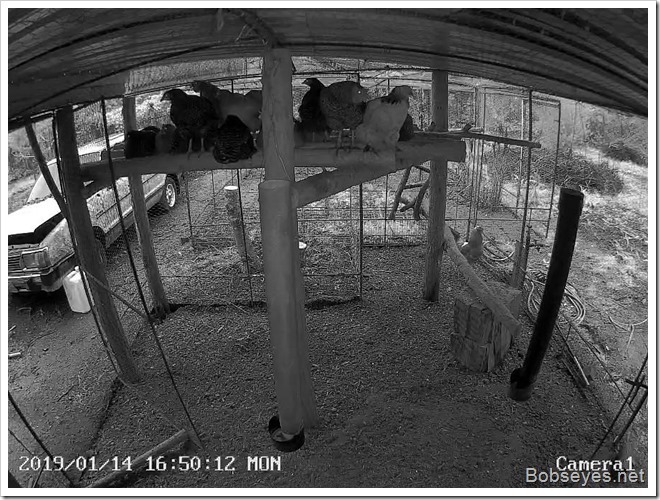 I plan to mount it in the chickens pen to watch them and whatever critters come around during the night. I bought this cam from Amazon. Here’s the cam’s web page. It’s the C2 Pro cam. The cam just came out. I’ve been waiting years for a much better less costly PTZ cam to come out with better Wi-Fi and I think this does just that. I’ve used some of the older stuff in the past, but they were costly and hard to set up and crashed a lot so a real pain. The wireless is dual speed and has the newer 5g which will soon be the rage of the world cause it will make Wi-Fi very much better than it’s been so far. Better speed and better coverage. The image is very good even at night. I highly recommend this one. 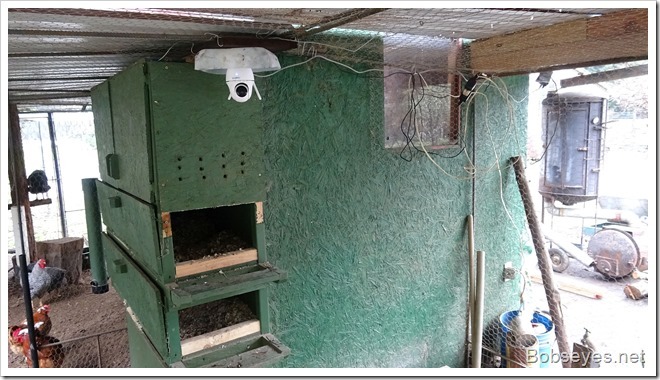 `Anyway I needed to get the cam mounted in the chicken’s pen. It’s not water proof so I needed to take precautions. I constructed this camera mount with the little mount that came with the cam. 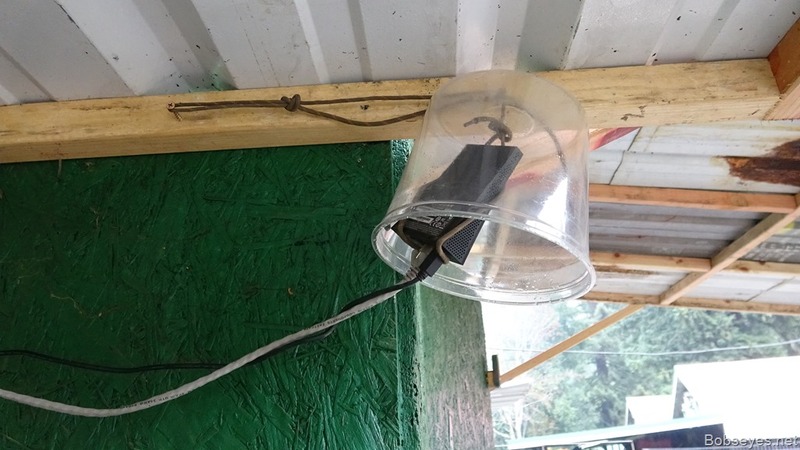 This should keep any water from coming down on the cam and it has wires to mount it to the top of the chicken pen roof. I didn’t have long enough wires for it, but I wanted to get it up and running. 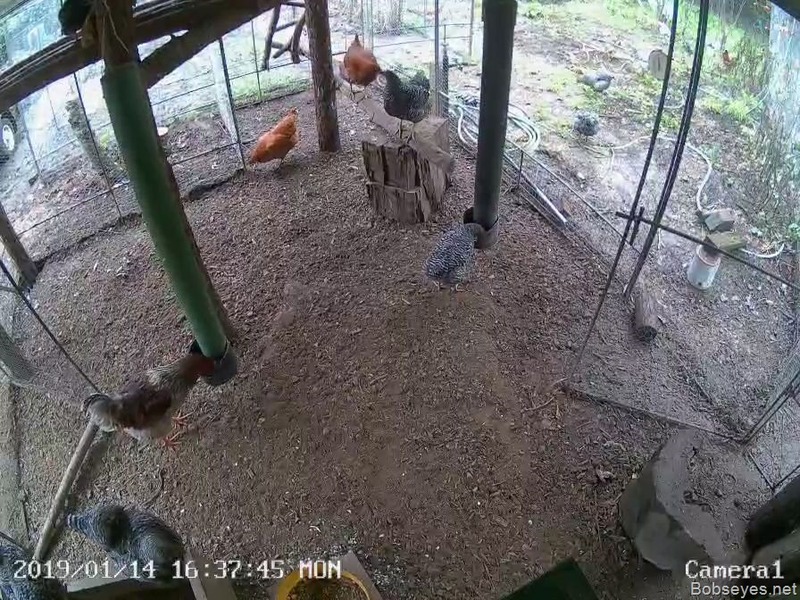 Here it is mounted over the chickens nesting box area. Here’s where I hooked it up to power which is temporary for now. It’s powered by a USB power pack and so is the Wi-Fi extender. 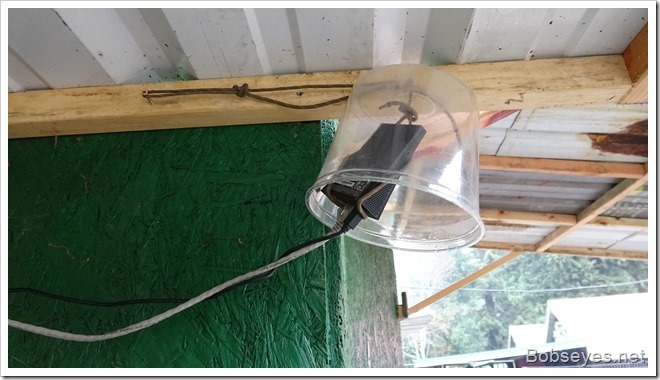 Because the cam is in a wire cage the Wi-Fi signals can’t get in or out of the wire cage so I had to do something to remedy that problem. I’ve had this Wi-Fi extender for awhile so now I could use it. 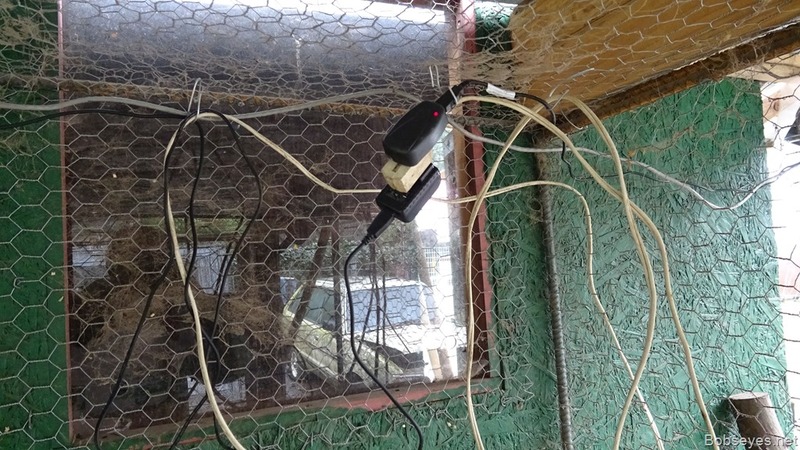 It brings the wireless out of the cage. Basically the wireless on the camera is turned off and this unit is plugged into it’s network wired port which brings the signal out to here. 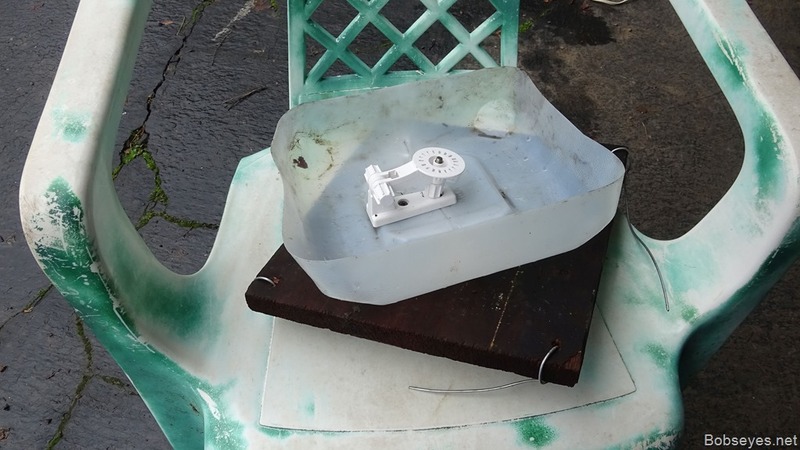 I used a plastic shield to keep any possible water off it and also not interfere with any of he Wi-Fi signal. 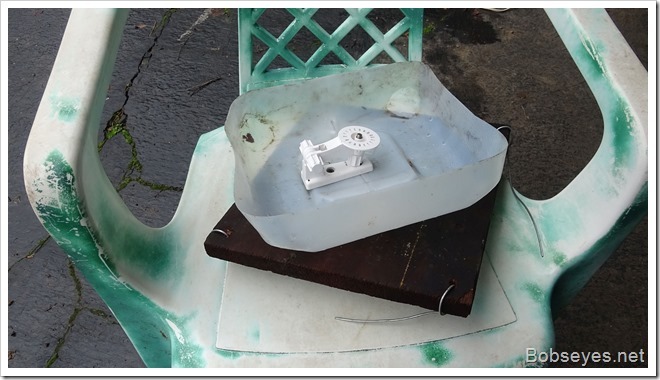 I was careful not to use anything metal in the mount. I used an old shoe string to hold it up. 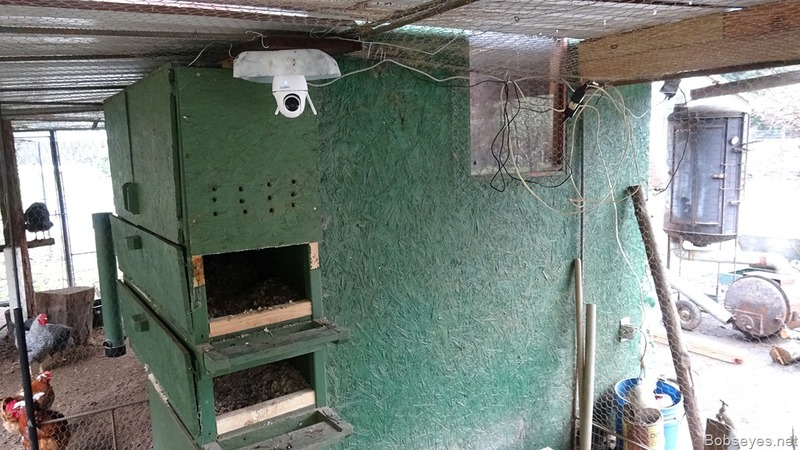 Here’s the camera in operation. My old router is not 5g but I was just able to get a signal way out here from the house’s wireless router. This works but it would be better if I had one of the newer 5g wireless routers to do the job as the signal would be stronger and handle more data faster so I plan to get a new router soon with the 5g. Just for your information. 5g Wi-Fi is coming on fast and soon the whole world will be covered with it. I read somewhere not long ago that they have a lot of 5g satellites ready to be launched. I can’t remember how many but it was a bunch of them like maybe 40,000 or was it 4,000 of them that will cover the earth. Either way it’s a lot. This will certainly change Wi-Fi for everyone drastically. Everything will be covered and the speed will be much much higher. It will be a world changer when it gets done. 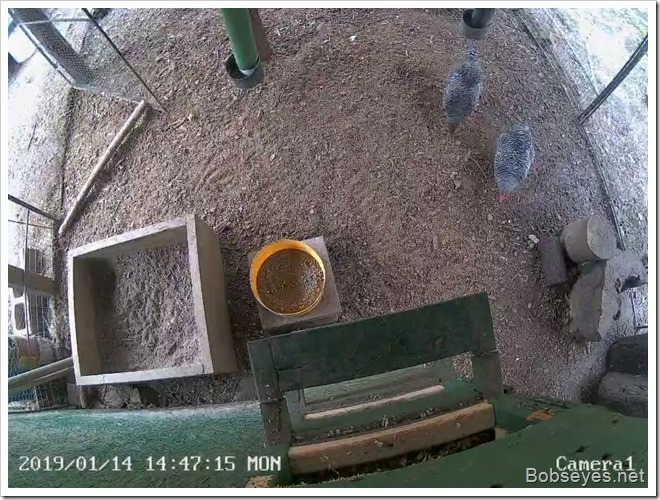 Anyway here’s a shot of what the camera sees over the nesting boxes. 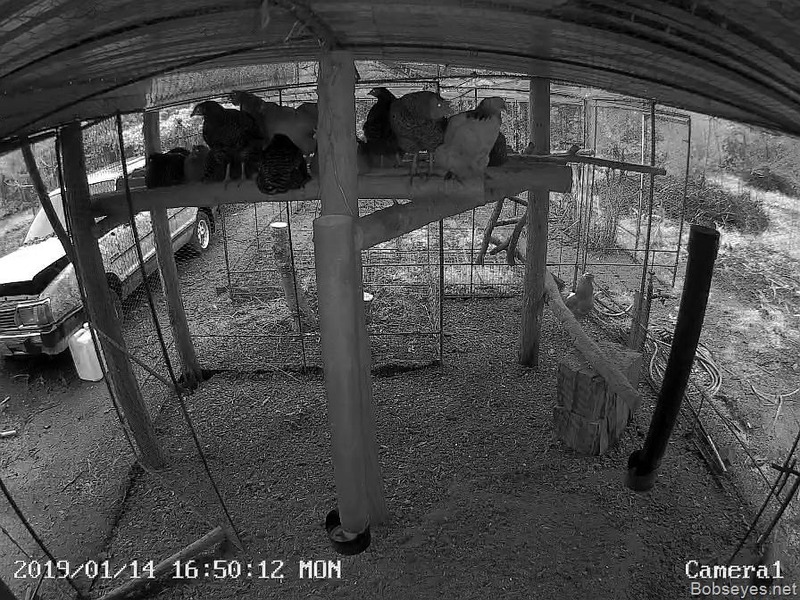 I can also move the cam around from my computer in the house and also set it to record when there is any motion in the picture. 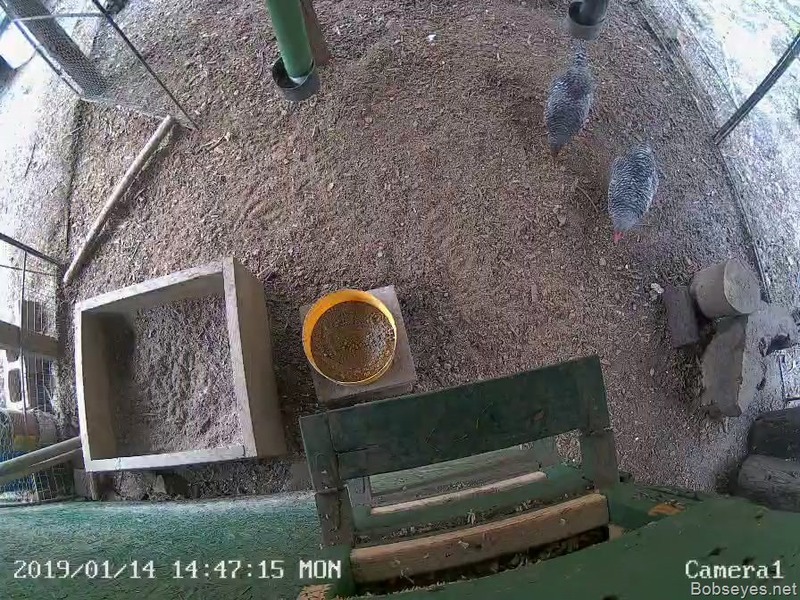 Now I’ll know whose laying eggs and who isn’t. 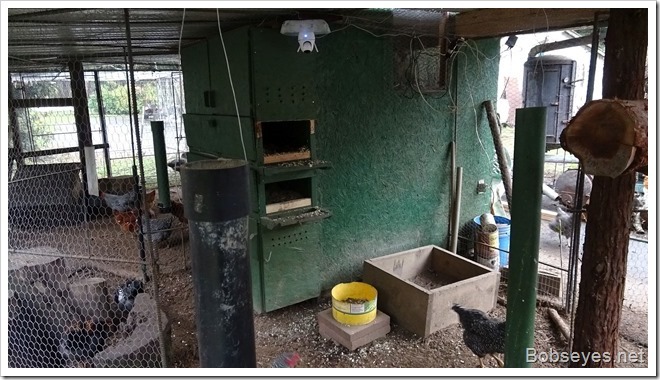 Anther shot of the chicken’s pen. Color in the day an black and white at night. Here’s a night black and white. This cam is very good as far as picture quality and also ease of use. Besides working on getting the cam set up I also did some puttering around the yard today doing a bit of this and a bit of that. It tried to drizzle some but just never really did that much. but it was one of those days. So now I need to go to town and get some longer network cables and maybe that newer 5g wireless modem/router for my computer hookup. 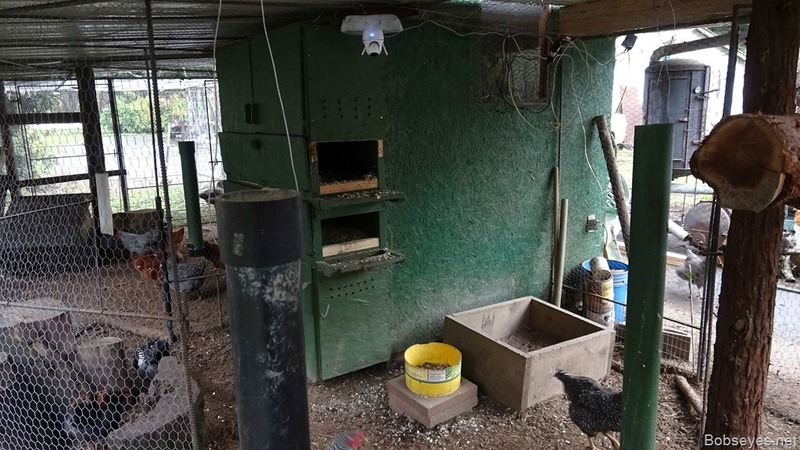 This entry was posted in Uncategorized and tagged chicken coop reolink C2 pro PTZ cam, ptz wireless camera. Bookmark the permalink. 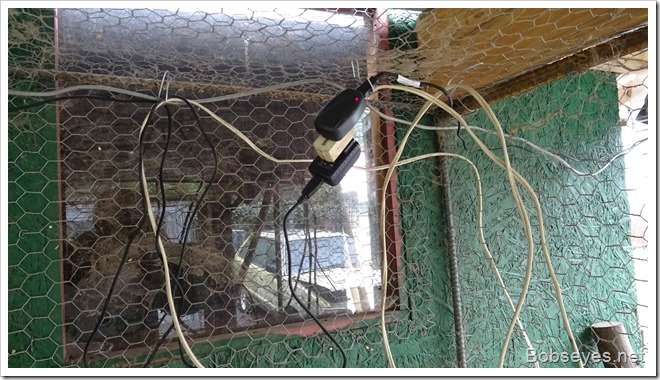 What an interesting set up you have there, keeping an eye n the chickens and nit have to leave the house, gotta love this modern technology.